Purpose: Use this document as a reference for processing enrollment cancellations in ctcLink. This process needs to be run before enrollment services can drop students for non-payment. Enter the Business Unit on the Enrollment Cancellation 1 tab. 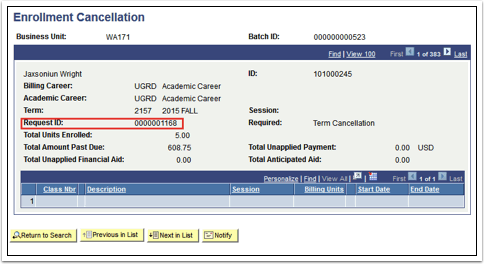 Check the Report Only checkbox to view a list of students eligible for cancellation without completing the process. Uncheck the Report Only checkbox if this is the actual run to drop all students with non-payment. Select the Term Cancellation radio button. All: Select to review all students in the business unit who meet the criteria that you specify. Tuition Group: Select to review students within a specific tuition group. Academic Program: Most popular option. Select to review student within a specific academic program. In the Aging Criteria section, select the By Date radio button and enter the payment deadline date. This is optional. In the Past Due section, enter student balance threshold into the Initial Amount field. Click the Enrollment Cancellation 2 tab. Enter ENRLCAN in the charges Item Group. Enter the From/To Term for the charges. The Charges are optional to select. This will reduce the charges by certain types of unapplied payments or financial aid not yet posted; or factor in anticipated aid a student might receive. Enter or select NOCAN in the Service Impact field to exclude students from the enrollment cancellation process. 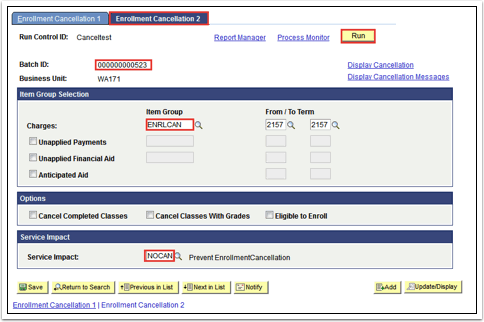 Click the Run button and then click OK.
Click the Display Cancellation hyperlink to review Enrollment Cancellation nominees. Make a note of the Batch ID once the process is run. You will need this to review the list of students. Navigation: Student Financials > Tuition and Fees Cancellation > Report Cancellation. Enter the Batch ID from the process above. 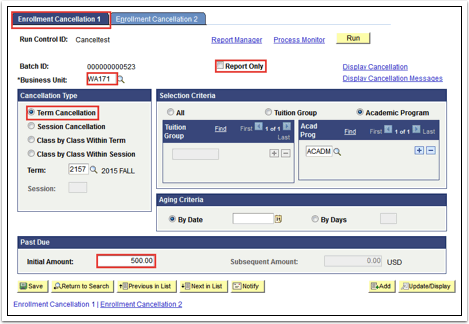 Click Run and check mark Term/Classes Cancellation for the BI Publisher process type. We are not using Crystal as a process type. Click the Process Monitor link and verify the run status is Success and the distribution Status is Posted. You may have to click the Refresh button occasionally. Click the Go Back to Enrollment Cancellation link. Select the most recent report and open the pdf. file to view the students selected for enrollment Cancellation. Enter the Business Unit and Batch ID. Provide the Batch ID number to the other departments to verify if a student should/should not be on there. If there is a student that SHOULD NOT be on the list, please have that department assign a service indicator of NOCAN. You will need to rerun the enrollment cancellation process to remove the student from the list. Make a note of the Request ID for enrollment services to use to finish the cancellation process.